First of all, there’s a great website that’s been going strong since 1997 called ePestSupply, and if you want to know the best kept secrets to ridding your home of termites yourself there’s no better place to look to find all the answers on this topic. In the scope of this post I cannot possibly give a full step-by-step guide to the termite problem, but I can tell you where to look for such a guide, give some information, and add my own experiences in dealing with companies and trying the DIY approach to the problem. If you think you have a termite problem then it’s wise to act pretty fast, and when you boil it down they’re only two viable options: call and exterminator or try to find the right termite killing insecticide and do it yourself. If you decide to DIY, there are a literal plethora of so-called ant, roach, spider, and termite “killers” out there to choose from, but none, absolutely none can compare with Bora Care (for wood), and Termidor SC (for treating the soil). You can always call your local exterminator if you have the means, and if you happen upon the right company that actually does the job in such a way that they’re gone, and gone for GOOD, in one assault (even if it lasts a month of the specialists coming back, but no longer than that, then please leave a comment with that company’s name and your location! Becoming informed and doing things yourself is almost always the best bet for any consumer to go unless a task is simply beyond your ability. Getting rid of termites is no small matter and requires some “know how”, but once you know what you’re doing, and why, it’s not that hard. 5-10% are those of the “drywood” termite (there are other species, but these two are your most common in the USA).. Knowing the difference means actually ridding your home of termites, or simply killing a few insects that happened to have gotten in your way when you undertook the valiant, but ineffective, effort. The website above will explain all you need to know to identify them easily. structural protection from subterranean termites”. 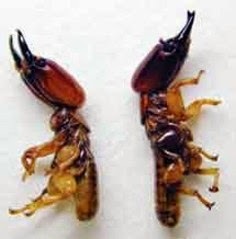 So, with subterranean termites, it’s going to be a two-step process of using a liquid spray and also a “bait” that termites are drawn to, then pick up or eat, and bring back to the nests to kill the eggs and those that were not affected by the liquid. So, once identified, then spray and baited, the problem is in theory, solved. However, the liquid and bait must be decided upon, and the correct application of them applied. Please visit the above site (ePestSupply) to discover an in depth guide on the “how to’s” of it all, or call your local pest control company. In any case, be informed about the problem and find the best possible solution. Or, if you really want the best of the best, call your local ICF home builders, and you’ll never have to worry about any such problem!